Vice-Chancellor of The University of Fiji Professor Prem Misir resigned amid drama in senior management, the Fiji Sun newspaper reported. Misir resigned on June 7, 2018, about three years after taking up the post. 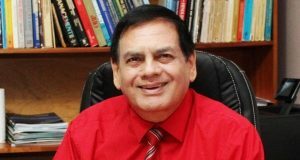 He resigned as the University of Guyana’s Pro-Chancellor on June 2,2014, ahead of his contractual period that would have expired on October 31, 2015. In making the announcement in a brief statement, the tertiary institution which is owned by the Arya Samaj organisation, said the academic did not provide any reasons for his resignation. There were employees who did not like Professor Misir. When he applied for work permit extension himself, five employees complained to the Immigration Department. He had to seek help from the Prime Minister’s office. The Fiji Immigration Department is said to have been reluctant to provide another work permit to Professor Misir. He resigned after that but, later changed his mind. When he called UniFiji to say he wanted to withdraw his resignation he was informed that his resignation letter had been accepted. He had also appointed Professor Narendra Reddy as the acting VC. In addition, when asked about when the post of the VC will be advertised, Mr Tikaram said that they would advertise in a month’s time. The senior management has been embroiled in employment issues regarding senior members of the university academic faculty, according to well-placed sources. They included Professor Narendra Reddy, Professor Tupeni Baba, Professor Ruvendra Nandan, Professor Shaista Shameem, Professor Anirudh Singh and Professor Subramani. Sources revealed that the seven professors met as a caucus about three or four months ago and lodged a complaint to the chair of the council, Anil Tikaram. He was asked to investigate allegations of breaches of regulations. Some staff were being hired and fired in alleged breaches of the employment law. In one case the contract of Professor Baba, who was the Dean of School of Humanities and Arts, was being terminated. He had earlier voiced his concerns about the alleged abuse of office at UniFiji. His termination was later reversed because there was no provision for probation in the contract and it was a breach. Professor Baba was not the only staff whose employment had been terminated. Professor ABM Shaukat Ali, who was a Science Professor and said to be very good at his job, had his contract terminated too. He had spoken up during a senate meeting that he did not agree with the new School of Social Science that was going to be developed. There are three employment cases against the university that are pending right now. The former staff members claimed they were wrongfully terminated.